“It is going to be extremely hazardous and should be immediately removed. It is also dangerous for pedestrians, especially because the poles are pointing towards the footpaths,” he said. BENGALURU: An innocuous measure to prevent parking by the roadside within NIMHANS campus here has been flagged as a safety hazard for pedestrians and motorists. Several roads within the large campus at Wilson Garden are used as thoroughfare for traffic. 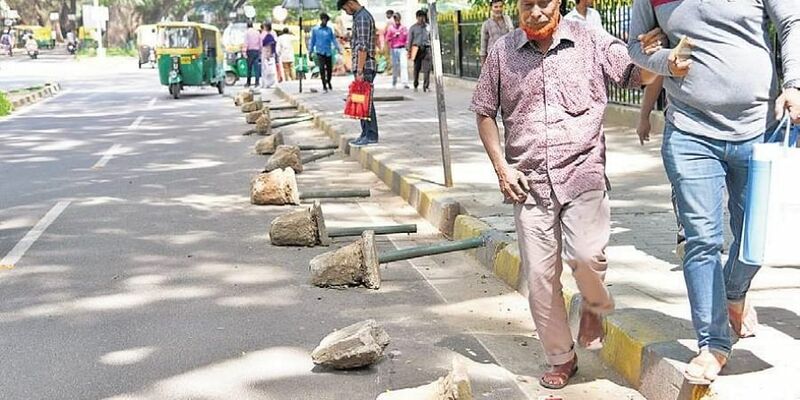 On one of these roads, to prevent non-visitors to the campus from parking on the road, security personnel have placed blocks of concrete attached to iron poles along the footpath. Transportation expert Lokesh Hebbani, from CiSTUP, IISc, agreed with Dr Verma. He highlighted the fact that in case any street light on the stretch was not working — which is a fairly common occurrence all over the city — the rocks could easily lead to an accident. Dr Verma suggested a safer method to enforce no-parking. He said a stencil marking could be made on the road, indicating it to be a no-parking zone, supplemented by signboards. He said camera surveillance was also another option. “Today, camera technology is very cheap. Cameras can be installed along the stretch,” he said.